David Sanders’ customers learn about him through word of mouth, literally. The smell of sugar cookies wafts through his home all day. 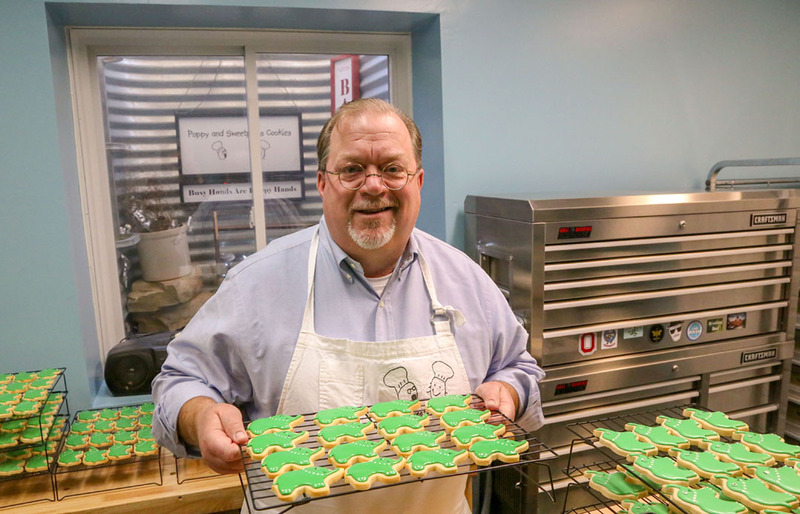 Sanders built a commercial kitchen in his home and launched Poppy and Sweetpea’s Cookies in 2013. The Carmel resident is working on a book about how to build a commercial kitchen in the home and will teach a workshop on the topic at Cookie Con, a gathering of cookie artists, in September in Indianapolis. Sanders also is auditioning for several shows on the Food Network. Sanders started decorating cookies when he was 5 years old, and his love for baking grew from his family’s annual Christmas cookie breakfast tradition. He said each Christmas his family baked more than 25 kinds of homemade cookies and candies and delivered them to friends and family. His family has continued the tradition of the Christmas cookie breakfast, and they also make opera fudge together on a marble slab that has been in his family for more than 50 years. His grandchildren call him Poppy. Sweetpea is the nickname for his youngest daughter. His customers now call him Poppy, too. 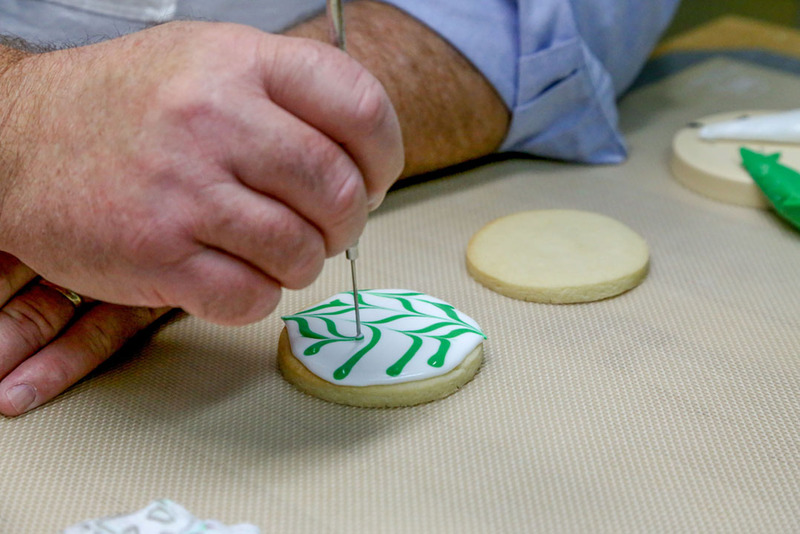 Through the years, Sanders has learned a variety of techniques, including stenciling and airbrushing, and he enjoys using a wet-on-wet technique to decorate the cookies. Sanders owns more than 1,000 cookie cutters. He handcrafts those he needs but doesn’t have in his wood shop. Some of his most unusual cookie cutters include a snail, a flying squirrel and all of the major Washington, D.C. monuments. 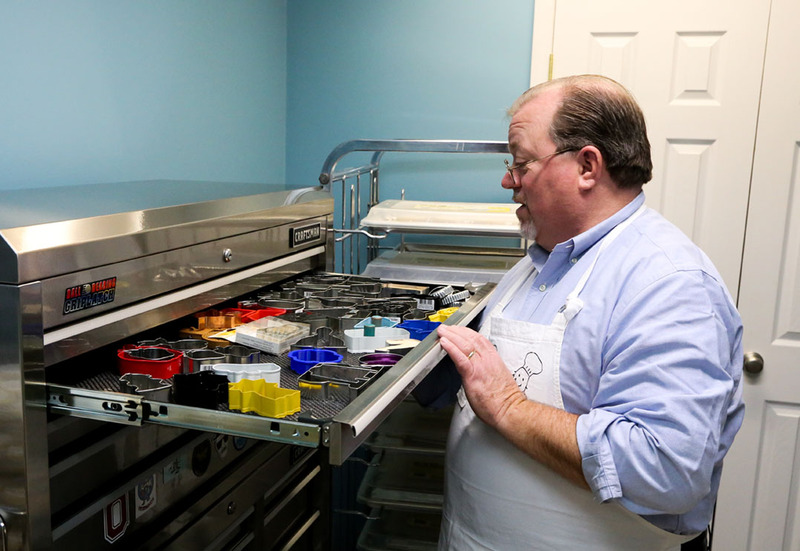 His bakery also includes a drawer filled with more than 80 dyes and a special printer that allows him to put edible photographs onto cookies. Sanders said he can bake 500 cookies in under three hours and spends about three to five minutes decorating each one. He said he spends 30-plus hours a week filling orders in his home bakery. “The house always smells like cookies,” he said. Sanders makes everything from scratch with fresh ingredients. He said he doesn’t like week-old cookies and runs his business like an old-fashioned bakery. One customer used a heart-shaped Poppy & Sweetpea’s cookie to propose to his girlfriend on Valentine’s Day. The cookie helped make the gesture extra sweet, and she said yes. Sanders said he loves the challenge of decorating a complex cookie. Poppy & Sweetpea’s Cookies specializes in decorating cookies for unique and celebratory events, such as baby showers, graduations and holidays. Sanders said he studied studio art in college and has always been an artist. “We’re all about making the best cookie possible for people to enjoy,” he said. Sanders loves being able to deliver fresh-baked goods, which he said is what he enjoys most about the business. Carmel resident Jennifer Beckman has made several orders for birthdays, Christmas parties and special events. Beckman said the cookies look like a work of art and that the maple danish rolls are mouthwatering. “Not only are they beautiful, but they’re absolutely delicious,” Beckman said. Sanders has received orders from around the world, including India and Japan. He said he visited Amsterdam a few years ago and visited more than 50 bakeries. Outside of his home, Sanders often hears people say they smell sugar cookies when they’re around him. “I’m just having a whole lot of fun with it,” he said. Sanders hosts workshops from his home bakery, which include sessions on how to make spritz, press cookies and decorate sugar cookies. Personal: Married to wife Michelle Rogers for 25 years. Has four adult children, Allison Schroeder, Emily Sanders, Isaac Sanders and Oakley Sanders, and four grandchildren. Career: Previously worked as an executive with Boy Scouts of America and was in the insurance industry for 31 years. He is semi-retired and sometimes works as an insurance consultant. Favorite Poppy & Sweatpea’s items: Maple danish, lemon snowflake cookie (shortbread with pecans and tart lemon frosting), spritz, the press cookies (because it reminds him of his childhood) and the cut-out sugar cookies because he can be creative with the design. Orders for Poppy & Sweetpea’s Cookies can be placed online. Prices depend on the complexity, quantity and shipping destination. For decorated cookies, a minimum order of 24 cookies is requested.